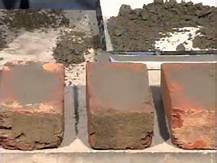 In this article Learn: tests for burnt clay bricks as per is:3495-1976,test for compressive strength,test for water absorption,Test for efflorescence. 1. Test for compressive strength. 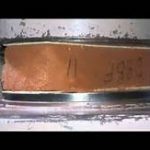 According to Tests for burnt clay bricks as per IS : 3495-1976, Grind the two bed faces to provide smooth, even and parallel faces. Immerse the specimen in water at room temperature. Remove the specimen from water after 24 hours and drain out any surplus water at room temperature. Fill up flush the frog and all voids with cement mortar (1part cement and 1 part clean coarse sand of grade 3 mm and down), store under damp jute bags for 24 hours and then immerse in clean water for 3 days. Remove and wipe out any traces of moisture. Place the specimen between two three plywood sheets, each 3 mm thick, with flat faces horizontal and mortar filled face facing upwards. The specimen sandwiched between the plysheets are carefully centered between plates of compression testing machine. Apply axial load at a uniform rate of 140 kg/cm2 per minute till failure. The maximum load at failure divided by the average area of the bed faces gives the compressive strength. 2. Test for water absorption. 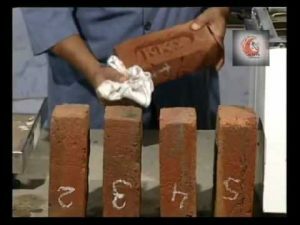 There are two tests to determine the test for water absorption, per cent by mass, for common burnt clay bricks viz., 24 hours immersion cold water test and the five hour boiling water test. Each one of these is described below. (a) 24 hour immersion cold water test. Dry specimen is put in an oven maintained at a temperature of 105 to 115ºC, till it attains substantially constant mass. Weight of specimen (W1) is recorded after cooling it to room temperature. The dry specimen is then immersed completely in water at a temperature of 27+2ºC for 24 hours. Take the specimen out of water and wipe out all traces of water with damp cloth. Complete weighing of the specimen 3 minutes after specimen has been removed from water. Let this weight be (W2). (b) Five-hour boiling water test. The specimen is dried in an oven at 105 to 115ºC till it attains constant mass. Cool the specimen at room temperature and record its weight (W1). Now immerse the specimen into a tank of water in such a way that water can circulate all around the specimen. Stir the water off and on so that any air inside it is removed. Heat the water at such a rate that it starts boiling in an hour. Continue to boil it for five hours. Then allow it to cool to 27+5ºC by natural loss of heat for 16 to 19 hours. Take the specimen out of water, let the water drain out completely and wipe it with damp cloth. Complete the weighing of the specimen in three minutes (W3). When the deposit of efflorescence is imperceptible. 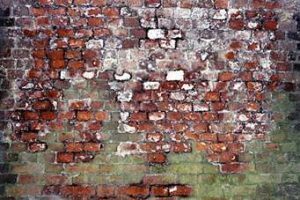 When the deposit of efflorescence does not cover more than 10 per cent of the exposed area of the brick. When the deposit of efflorescence is heavier than slight and does not cover more than 50 per cent of the exposed area of the brick surface. The deposit should not, however, powder or flake of the surface. When the deposit of efflorescence salts is heavy and covers 50 per cent or more of the exposed area of brick surface. The deposit, however, does not powder or flake of the surface. When the deposit of efflorescence salts is heavy and is accompanied by powdering and/or flaking of the exposed surfaces. People most did the cement strength with cement compression testing machine.